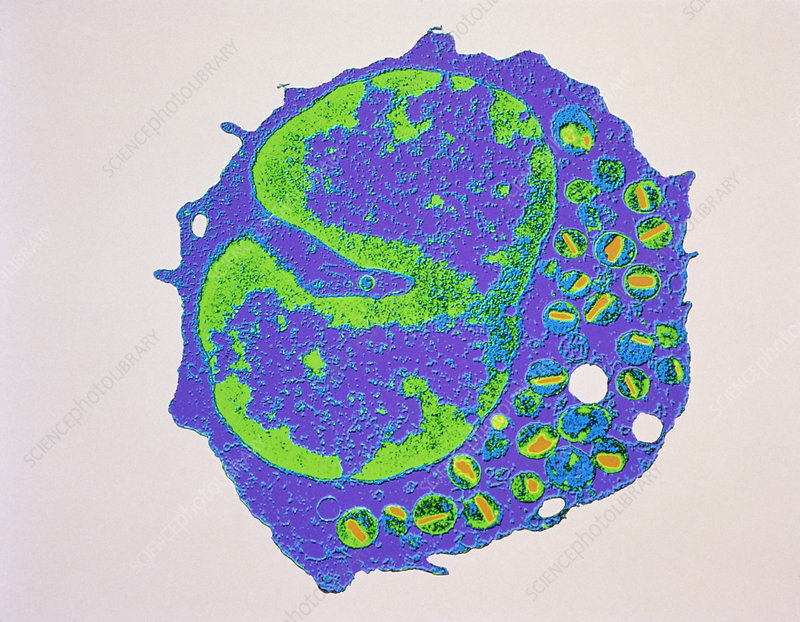 False colour transmission electron micrograph of a section through an eosinophil, a type of white blood cell. Eosinophils possess a large bilobed nucleus (left) and a cytoplasm packed with specific granules (circular), each containing a dense crystalloid. The matrix of the granules contains enzymes, including histaminase; the function of the crystalloids is uncertain. The population of circulating eosinophils increases in certain parasitic infections such as hookworm, but their role in such processes is unclear. Eosinophils are involved in inflammatory & immune responses, often in conjunction with other white cells. Mag: x4,000 at 6x7cm, x2,000 at 35mm size.